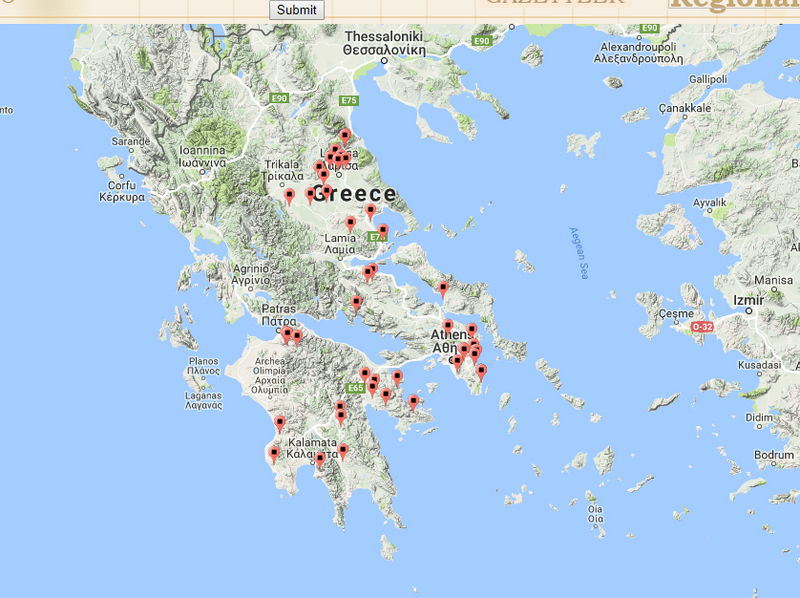 The purpose of the Mycenaean Atlas is to furnish accurate lat/lon pairs for Bronze Age sites in the eastern Mediterranean. The emphasis of the Atlas is on the Later Greek Bronze Age (the Mycenaean) although the Atlas does include sites associated with the Early Bronze, Middle Bronze, Sub-Mycenaean, and the Geometric. Presently there are more than 3000 named and located sites in the Atlas. From the control screen you can reach all the available controls in the MAP. It contains the usual menu controls: Search, Info page, Using the MAP, and Blog. By inspecting the results you can see that each returned result is paired with a link to the place key (or feature key) page on which that tag was found. Sections of the place key page are indexed separately and those sections appear separately on the search results page. Currently the sections are 'Site Name', 'Site Comment', 'Type Comment', 'Period Comment', and 'General Note'. 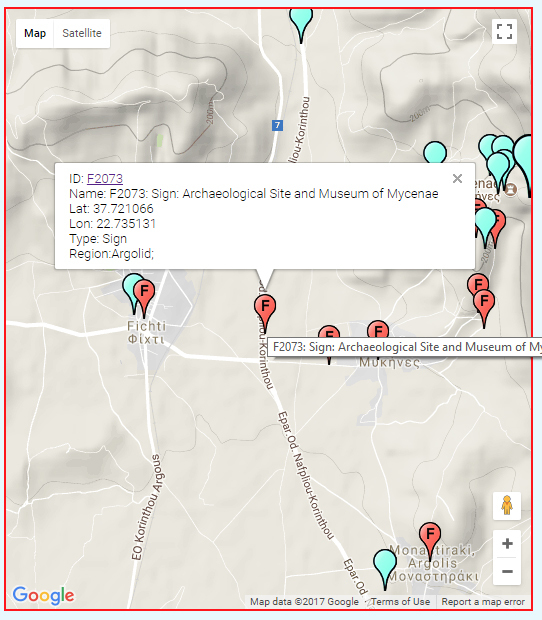 So the result Tiryns: Lower Town' is paired with the site identifier 'C845' which, when clicked, returns the Place Key Report for 'Tiryns: Lower Town'. Do not enter html tags or special characters. a. The entire DB is converted to single tokens paired with their place key or feature key links. b. The 100 commonest words in English are stripped out. c.	Single character returns are stripped out. d.	The remainder are stored in their own search table in the DB and this is the table that the run-time code searches. 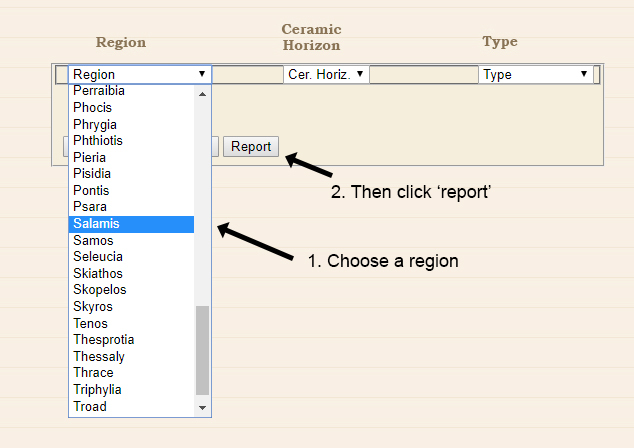 The 'Combined Control' allows you to draw a map using one or more of three criteria: Region, Ceramic Horizon, and/or (artifact) type. To reset these three criteria to null simply click on the 'Reset' button. Using the control is simple. Click on the arrow of the desired criterion (e.g., 'Region') and you will get a drop-down menu. Click on, say, 'Magnesia'. Then click on the 'Generate Map' button. Your map will appear. Here is the Magnesia example. The Elevation control allows you to draw a map with just those sites (of whatever kind) which lie between two elevations. For example you may be interested in a map of sites close to the sea. To generate such a map you can specify 0 (all measurements in meters) for the Low box and, perhaps, 100 for the High box. When you press 'submit' your map will be drawn. At the time this guide was written such a search would return 824 sites. Here's a portion of that map taken from the south-western Peloponnese. There's actually quite a lot of information on this map. Notice how so many of these sites are right on the shore. It would be easy, for example, to generate a list of these communities just by pressing the .kml button on the map (described later). This map also suggests where the seashore might have been in antiquity particularly in the Pamisos region . You don't have to use 0 as the 'Low' parameter. You may be interested in just those sites between 100 and 110 m. in elevation. In that case enter '100' for the Low parameter and '110' for the High. This control allows you to search for habitations in user-defined ranges. The units are square meters; one hectare is 10,000 square meters. At the time this was written the average habitation size (arithmetic mean) in the Atlas is 31900 square meters (3.2 ha.) but this measure is skewed by very large sites at the upper end. A better average measurement might be the median of all habitations (that measure right in the middle of the whole set); that is about 12000 square meters (1.2 ha.). The habitation sizes in the DB are not normally distributed; they are skewed to the left. I have been told by professionals that these habitation size estimates are not very reliable. I'm sure that that's true. Putting that question aside for a moment I feel that important analysis can be performed even if all we have are relative sizes of sites. There is a great deal of interest in settlement hierarchy sizes (relative sizes) as a clue to the organization of a society and I know of no other way that professionals have easy access to such data and for that reason I include it. The average of these estimates is 1.975 ha. Surprisingly close to the real value of 2.0 ha. Now this example was cooked up in order to illustrate the idea. But does this work in real life? Can a series of estimates converge on the actual value? In lots of cases it can. To see why let us imagine a fifth scholar, E, who visits the site and gives an estimate of 100 ha. Impossible? Well, nearly. The odds of any experienced and reliable scholar, such as E, giving an estimate such as 100 ha. and which wildly varies from the true value (of 2.0 ha.) are almost exactly zero (0.0). And the odds are also nearly zero for any scholar to estimate its size as 20 ha., or 10 ha. The odds are better that some enthusiastic researcher will return an estimate of 5.0 ha. or 4.0 ha. But experience (scholars A through D) has shown that the most likely estimate of the habitation size of A is going to fluctuate around its true value of 2.0 ha. Of course field conditions can actively work against this idea. There are a number of sites on the seashore (or actually underwater such as Nisakouli (C1921) in Messenia) where the ocean has worn away significant parts of the site. Nonetheless the truth is in the aggregate. If the Atlas only supports relative site size comparisons it will have accomplished its job. 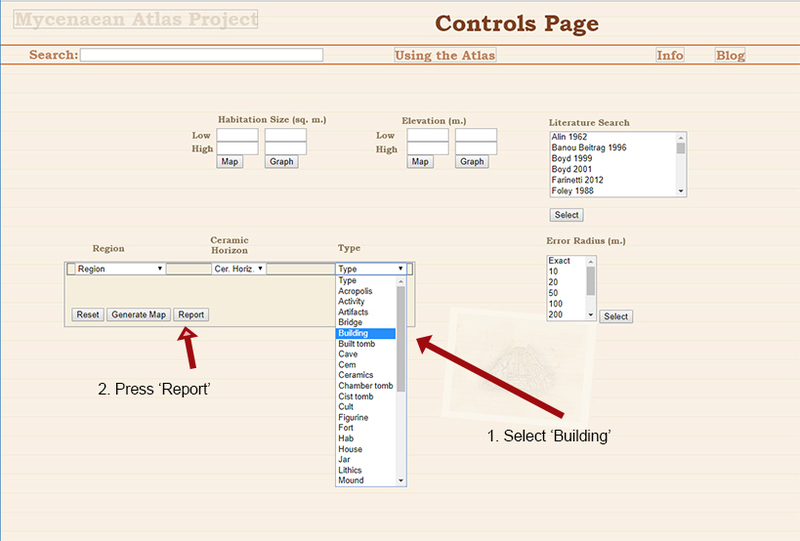 The Controls Page supports a control that allows you to see Atlas coverage of several well-known literature sources. 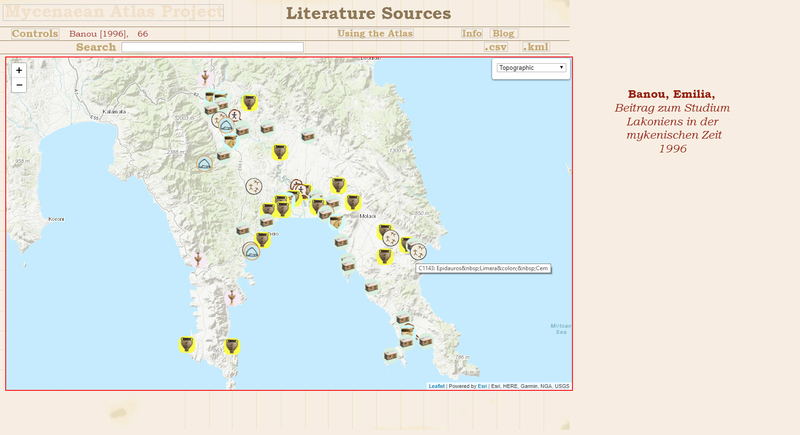 Making a selection and pressing 'Select' will generate a map with just sites from that source shown. So, for example, if you selected 'Alin 1962' and pressed 'Select' then you would be shown a map consisting of DB points described in Per Ålin's Das Ende der Mykenischen Fundstätten auf dem Griechischen Festland, from 1962. Ålin, Per, Das Ende der Mykenischen Fundstätten auf dem Griechischen Festland. Carl Bloms Boktryckeri A.-B., Lund, 1962. Banou, Emilia. Beitrag zum Studium Lakoniens in der mykenischen Zeit, Albert-Ludwigs-Universität zu Freiburg. 1996. Boyd, Michael John. Middle Helladic and Early Mycenaean Mortuary Customs in the Southern and Western Peloponnese. University of Edinborough. Scotland. 1999. Boyd, Michael J., Middle Helladic And Early Mycenaean Mortuary Practices In The Southern And Western Peloponnese. np. 2001. Farinetti, Emeri. 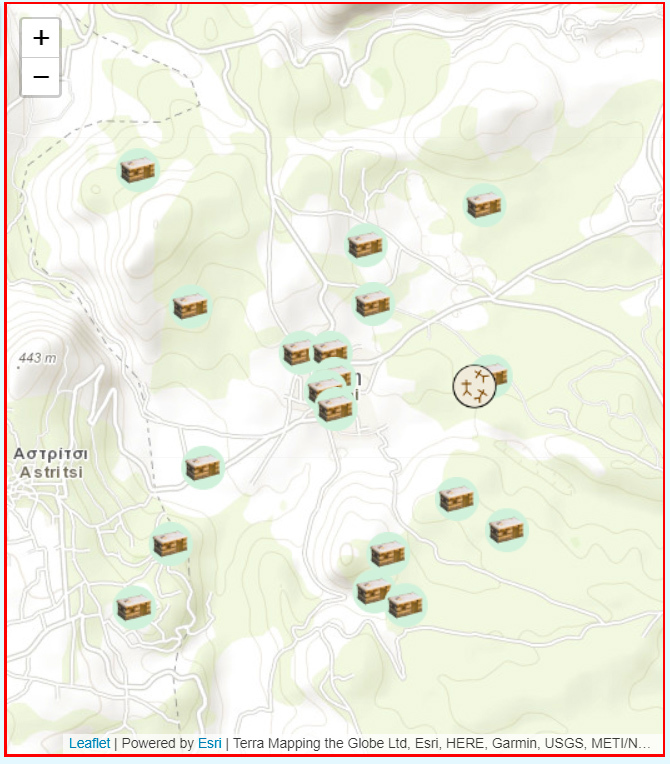 Boeotian Landscapes; A GIS-based study for the reconstruction and interpretation of the archaeological datasets of ancient Boeotia. Faculty of Archaeology, Leiden University. 2009. Foley, Anne. The Argolid 800-600 B.C. : An Archaeological Survey : Together with an Index of Sites from the Neolithic to the Roman Period Göteborg : P. Åströms Förlag, 1988. Fossey, John M., Topography and Population of Ancient Boiotia, Ares publishers Inc., Chicago, Illinois. 1988. Giannopoulos, T., Die Letzte Elite der mykenischen Welt: Achaia in mykenischer Zeit und das Phänomen der Kriegerbestattungen im 12.-11. Jahrhundert v. Chr., Bonn: Habelt. 2008. Hood, Sinclair and Peter Warren, Gerald Cadogan, 'Travels in Crete, 1962', The Annual of the British School at Athens (59), pp. 50-99, 1964. Immerwahr, Sara A., The Athenian Agora; Vol XIII; The Neolithic and Bronze Ages. The American School of Classical Studies at Athens, Princeton, New Jersey. 1971. Jameson, Michael H, Curtis N. Runnels, Tjeerd H. van Andel, A Greek Countryside; The Southern Argolid from Prehistory to the Present Day, Stanford University Press, Stanford, California. 1994. Kanta, Athanasia, The Late Minoan III Period of Crete. Paul Åströms Förlag, Göteborg. Sweden. 1980. Waterhouse, Helen and R. Hope Simpson, "Prehistoric Laconia: Part II", The Annual of the British School at Athens, Vol. 56, pp. 114-175, 1961. Langohr, Charlotte, PERIPHEREIA: Étude régionale de la Crète aux Minoen Récent II-IIIB (1450-1200 av. J.-C.) 1 | La Crète centrale et occidentale, Presses Universitaires de Louvain, Belgium, 2009. Lolos, Yannis A., Land of Sikyon: Archaeology and History of a Greek City-State, Hesperia supplements, 39. Princeton: American School of Classical Studies at Athens, 2011. 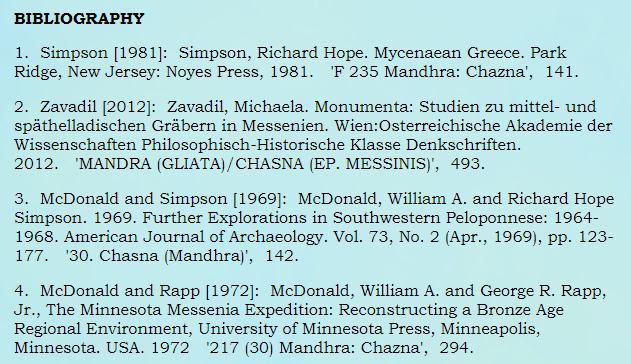 McDonald, William A. and George R. Rapp, Jr., The Minnesota Messenia Expedition: Reconstructing a Bronze Age Regional Environment, University of Minnesota Press, Minneapolis, Minnesota. USA. 1972. Melas, Emmanuel, The Islands of Karpathos, Saros and Kasos in the Neolithic and Bronze Ages, Paul Åströms Förlag, Göteborg 1985. McDonald, William A. and Richard Hope Simpson. 1961. Prehistoric Habitation in Southwestern Peloponnese. American Journal of Archaeology. Vol. 65, No. 3 (Jul., 1961), pp. 221-260. McDonald, William A. and Richard Hope Simpson. 1964. Further Exploration in Southwestern Peloponnese: 1962-1963. American Journal of Archaeology. Vol. 68, No. 3 (Jul., 1964), pp. 229-245. McDonald, William A. and Richard Hope Simpson. 1969. Further Explorations in Southwestern Peloponnese: 1964-1968. American Journal of Archaeology. Vol. 73, No. 2 (Apr., 1969), pp. 123-177. Mountjoy, Penelope A., Mycenaean Athens. Paul Åströms Förlag, Jonsered, Sweden. 1995. Myers, J. Wilson and Eleanor Emlen Myers, Gerald Cadogan, The Aerial Atlas of Ancient Crete. University of California Press, Berkeley, Los Angeles. United States of America. 1992. Nowicki, Krzysztof. Defensible Sites in Crete; c. 1200 - 800 B.C. (LM IIIB/IIIC through Early Geometric), Aegaeum (Annales d'archéologie égéenne de l'Université de Liège et UT-PASP), 21. 2000. Panagiotakis, Nikos, 'L&apos;évolution archéologique de la Pédiada (Crète centrale) : premier bilan d&apos;une prospection', Bulletin de Correspondance Hellénique (127:2), 327-430. 2003. Papadopoulos, Thanasis J., Mycenaean Achaea; Part 1: Text. Paul Åströms Förlag, Göteborg, Sweden. 1979. Vol 1. 1979. Pelon, Olivier. 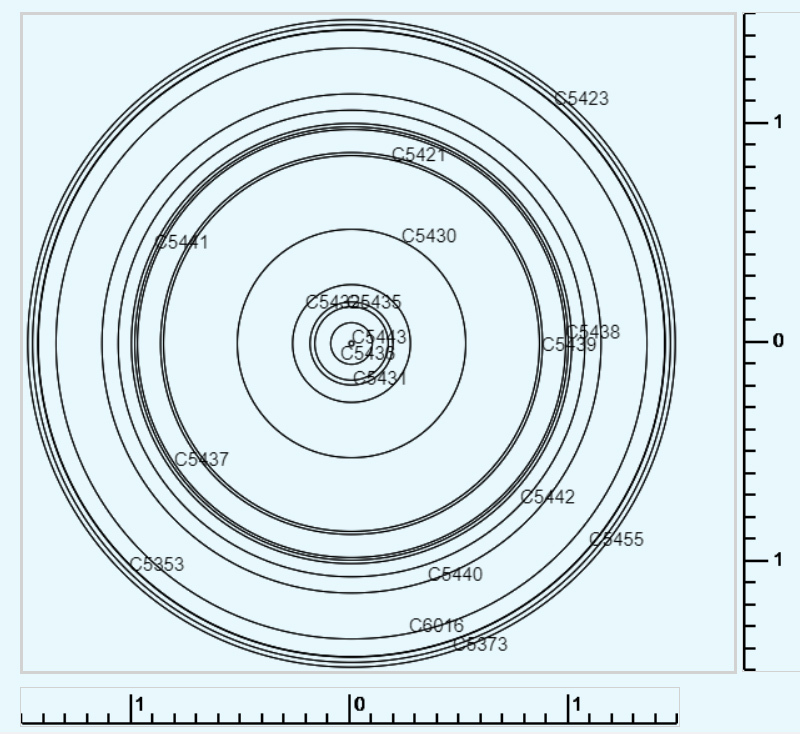 Tholoi, tumuli et cercles funéraires; Recherches sur les monuments funéraires de plan circulaire dans l'Égée de l'Âge du Bronze (IIIe at IIe millénaires av. J.-C).Bibliothèques de l'École française d'Athènes et de Rome - Série Athènes, 229. 1976. Privitera, Santo. Principi, Pelasgi, e pescatori: L'Attica nella Tarda Eta del Bronzo, Paestum: Pandemos. 2013. Simpson, Richard Hope. Mycenaean Greece. Park Ridge, New Jersey: Noyes Press, 1981. Simpson, Richard Hope. Mycenaean Messenia and the Kingdom of Pylos. Philadelphia:Instap Academic Press, 2014. Simpson, Richard Hope and O.T.P.K. Dickinson, A Gazetteer of Aegean Civilization in the Bronze Age, Vol. I: The Mainland and the Islands, Paul Åströms Förlag, Goteborg. 1979. Souyoudzoglou-Haywood, Christina, The Ionian Islands in the Bronze Age and Early Iron Age; 3000-800 B.C., Liverpool University Press. 1999. 978-0853236542. Syriopoulos, Konstantinos, He proistorike katoikesis tes Hellados kai he gennesis tou Ellenikou ethnous, B' (The prehistoric settlement of Greece and the origin of the Greek people), Athens: Athens Archaeological Society. 1995. UMME. This is redundant to McDonald & Rapp, 1972 combined with Simpson 1981. It is a handy way to look at the coverage of the Minnesota-Messenia Expedition. van Wijngaarden, G., Use and Appreciation of Mycenaean Pottery in the Levant, Cyprus and Italy (ca. 1600 - 1200 BC). Netherlands Organisation for Scientific Research and Amsterdam University Press. 2002. Zavadil, Michaela. Monumenta: Studien zu mittel- und späthelladischen Gräbern in Messenien. Wien:Osterreichische Akademie der Wissenschaften Philosophisch-Historische Klasse Denkschriften. 2012. The others are extensively covered but not complete. Much material is redundant. For example Messenia I, II, III and Simpson & Dickinson  are only partly integrated as yet because much of their material is covered in Simpson . Nonetheless these other sources will eventually be completely integrated into the DB. The total number of bibliographic sources for this database now numbers some 1000 items but these are the most significant. 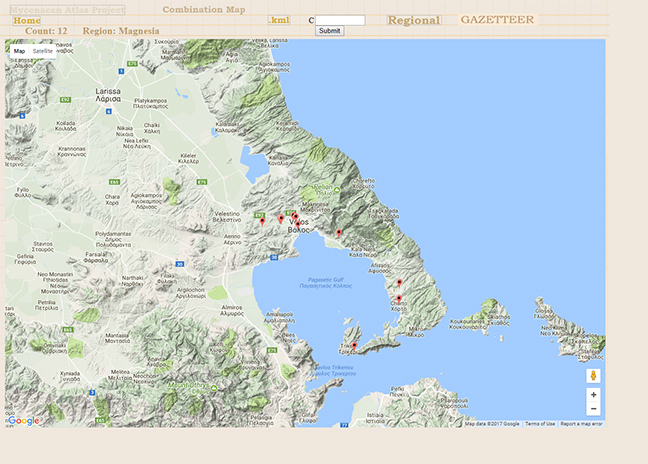 In addition to displaying Mycenaean sites on maps this site also provides reporting facilities. The report page is triggered both from the Controls Page Combo Map Box as well as the Combination Map itself. When, from the Controls page, you select some criterion such as the region name ‘Salamis’ you can then click on the ‘Report’ button. The resulting REPORT page provides a site breakdown by the number of times sites fitting your criteria are tagged with specific types. This gives you an idea of the dominant use of your chosen sites. There is also a site breakdown by regions. In this example using ‘Salamis’ all the sites are in that region and no other. If you selected some criterion other than region you will get a table that lists all the regions containing sites that fit that criterion. 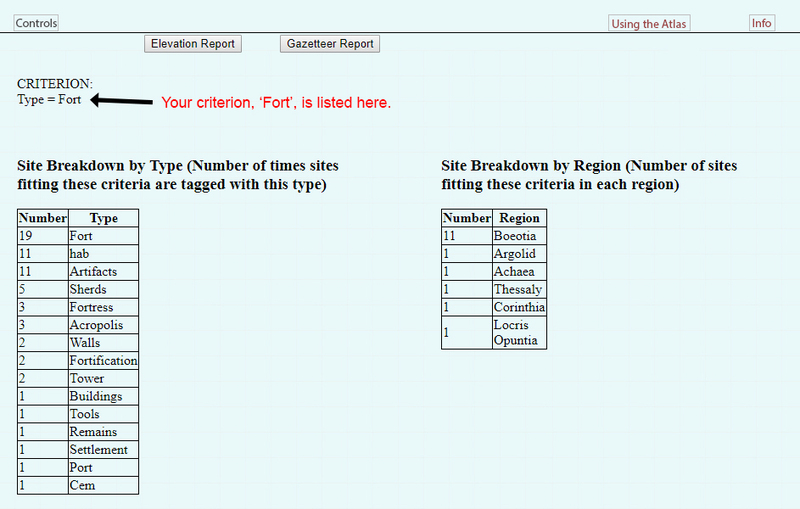 For example if you chose the type ‘Fort’ the table would show all the regions that contain a site typed as ‘Fort’. Here those include ‘Boeotia’, ‘Thessaly’, ‘Corinthia’, ‘Locris Opuntia’, ‘Argolid’, and ‘Achaea’. The basic REPORT page also has two buttons, ‘Elevation’ and ‘Gazetteer’ that, when clicked, will provide more detailed reports. The Gazetteer Report button provides a basic list of all the sites that fit your criterion. Clicking the elevation report button provides further analysis of the elevations of the sites fitting your criterion. The elevation report provides several things. The first is a basic statistical parameters section. - Arithmetic mean of elevations of the sites that fit this criterion. This is the sum of the elevations divided by the number of sites. - Median elevation. The median is another measure of central tendency. It is that actual elevation which falls halfway between the lowest and the highest elevations. Kurtosis This is a parameter that indicates how much of the population is in the tails as opposed to the shoulders of the distribution. For more information about skew and kurtosis and how to interpret them see this. The elevation report also provides two graphs. The first shows the frequency of various elevation ranges; that is, it maps the elevations into the frequency domain. The horizontal axis is elevations from 0 to highest elevation in the set. The vertical axis shows the frequency of sites whose elevations are in that range. The second graph is a straight-forward plot of sites against their elevations in the order of increasing elevation. The horizontal axis is the site names in order of elevation from lowest to highest. The vertical axis is elevations. Beneath the charts are two tables. The left-most table is a list of all the sites fitting these criteria which have elevations lower than the arithmetic mean. The right-most table is a list of all the sites fitting these criteria which have elevations greater than the arithmetic mean. The columns in both tables are sortable. The place key numbers in those tables, when clicked, will bring up a place key report for that site. 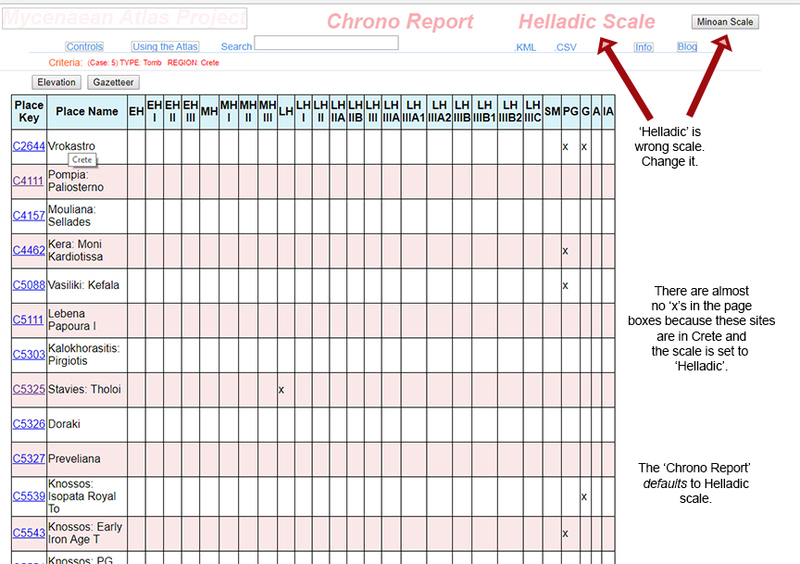 The Chrono report generates a table of occupation times based on your choices from the selection control on the Controls page. This control allows you to select a combination of Region, Ceramic Horizon, or Type. After making your selection click on the 'Report' button. This brings you to the main report page. That page now has a 'Chrono' button. When you click on that button you will be given a chronological table on which your selection sites will be plotted with 'x's in the appropriate time span columns. Let's look at an example. In the left-hand column are the place keys for all the places in your selection set. They are clickable. When you click on one you'll be taken to the specific Place Key Report page for that site. The second column is the place name. The names in this column are mouseable. When you run the mouse over them the region name will pop up in a tool-tip. Succeeding columns, 'EH', 'EH I', 'EH II' etc., are the ceramic horizon columns. If there is evidence for your site having existed, been used, etc. during any specific ceramic horizon then there will be an 'x' in the box for that ceramic horizon. Here we can see that C1164, Troullos on Kea, existed in the LH I and the LH II. The column headers with the ceramic horizon names are mouseable. When you do mouse over them the approximate year range will pop up in a tool tip. It must be emphasized that these ranges are very approximate and scholars differ over what the proper year ranges should be for any specific ceramic horizon. Please keep this in mind. As I learn better ranges for specific ceramic horizons then I will probably change these tool tips. The 'x' characters in the table boxes are also mouseable. When you do pass the mouse over them then the ceramic horizon label will pop up. This is intended to make it easier to work with the table when the column headers are out of sight. When creating this table I faced the choice of making the table pageable (column headers never out of sight) or sortable. I chose sortable as probably the more useful alternative. 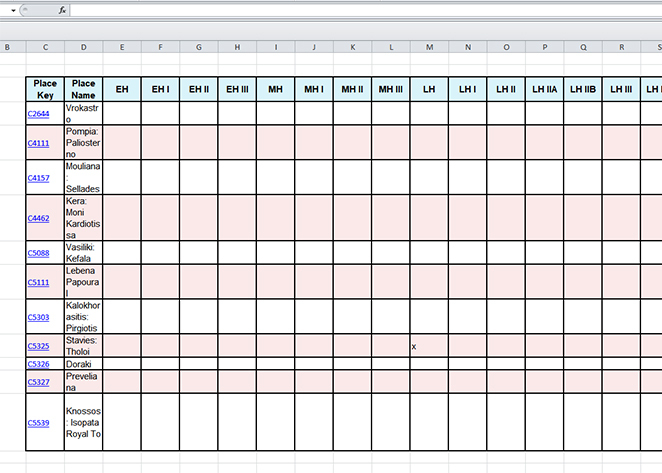 When you click on the column heads the table will be re-sorted to put your criterion at the top. Because spaces in the cells sort before the character 'x' by default you'll probably have to click twice on any specific column head to get the effect that you want. Also keep in mind that there are really two chrono pages, one in the helladic name style: 'EH', 'MH', 'LH' etc. and one in the Minoan name style 'EM', 'MM', 'LM', etc. These pages function differently. 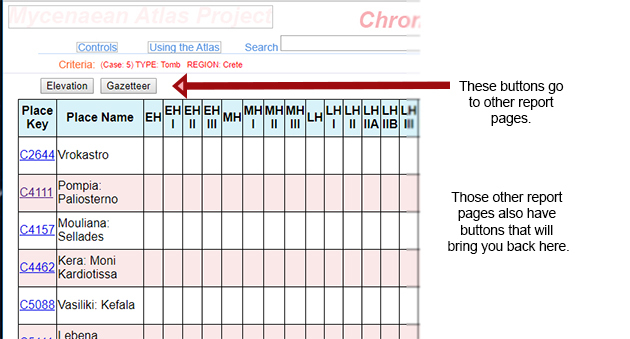 If your chosen data set has sites from Crete then the default or initial chrono page will show few or no 'x' characters in the table. In order to see a meaningful chart you will switch to the 'Minoan Scale' page. Probably the most disorienting thing that a user can do is to make some choice like 'Crete' and then be faced with an empty chart and not know why. Remember to switch scales. The button to do this is at the upper right of the page and labelled 'Minoan Scale'. Also keep in mind that some sites, particularly in the islands, have ceramic horizons in both styles. You will need to look at such sites under both scales. 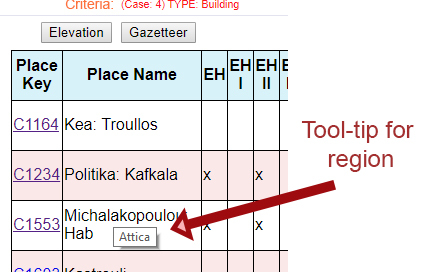 If you are on the Minoan Scale page there is also a button, in the same place, for switching back to Helladic. 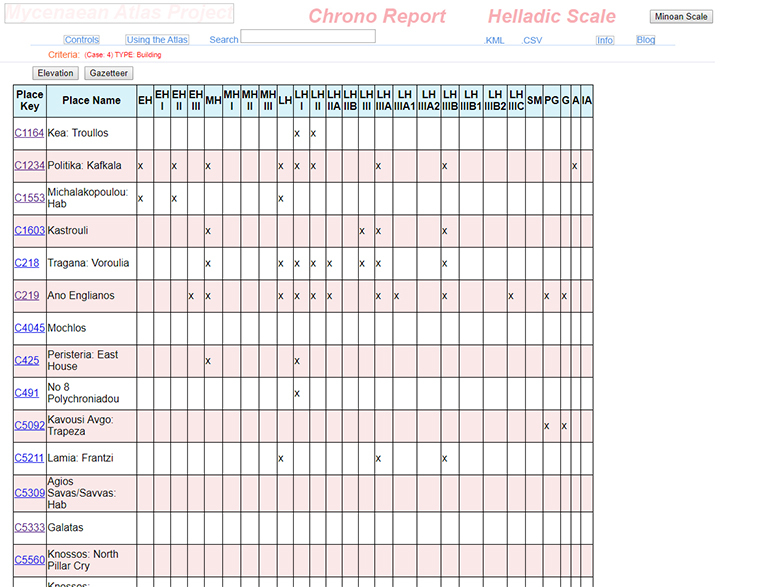 I have not yet implemented a page for the Cycladic time scale. 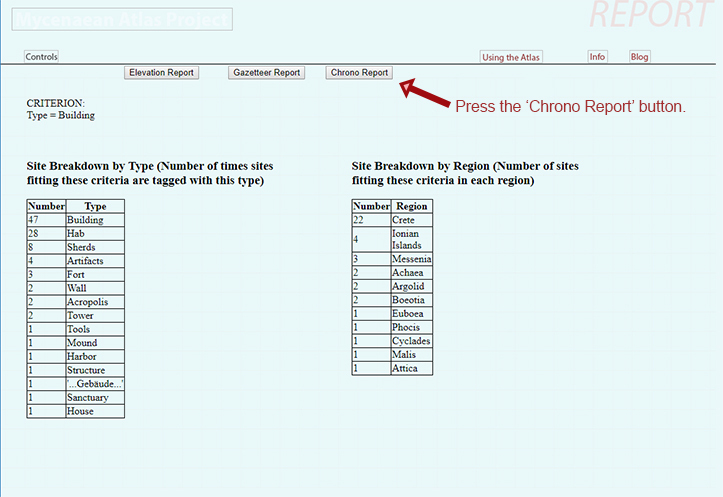 There are buttons on the chrono pages that allow you to go to the elevation report page or the gazetteer report page. Those pages now also support buttons that allow you to go to the Chrono page. This should make multivariate analysis more convenient. The Gazetteer report is a simple list of all the sites which meet the specified criteria. The criteria themselves are listed on the top of the page. A sortable and clickable list of all the relevant sites follows this. The list is sortable by clicking on the column heads. 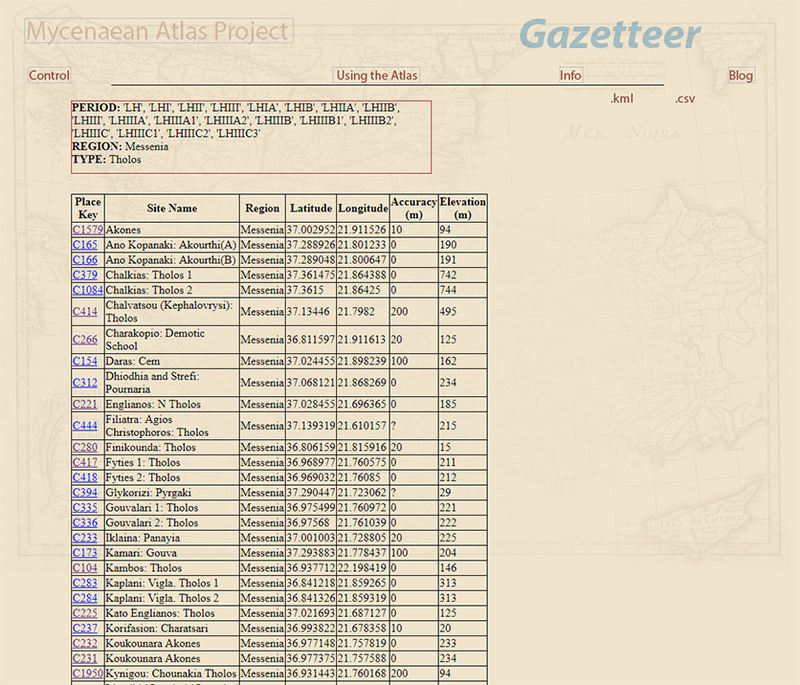 The bibliography for the Mycenaean Atlas Project now numbers more than 1000 items. 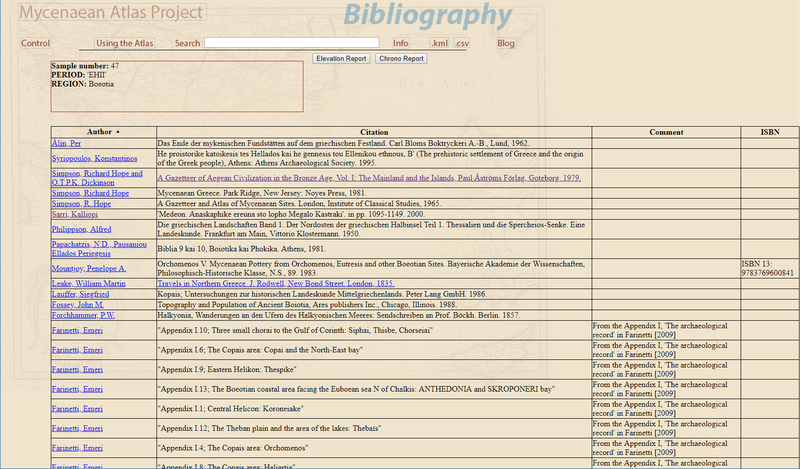 For a long time I have wanted to be able to present the bibliography online in a focused and analytical fashion. From the beginning it was possible to create a map that showed every location documented by specific scholars. It was possible to create, for example, a map of the Mycenaean world which showed just those sites for which Simpson’s Mycenaean Greece was one of the sources. At the present time one can draw such a map for any one of 40 different scholars. This is useful, for example, in tracking the actual coverage that the MAP gives to any one of these prominent writers and these maps change as more and more of their sites are given place in the Atlas. Here, for example, is a map based on Emilia Banou's Beitrag zum Studium Lakoniens in der mykenischen Zeit from 1996. These are all the sites for which her work is at least one of the supporting citations. There is, however, more in the Bibliography than just those prominent scholars. At a minimum it should be possible to produce customized bibliographies. If a user chooses just to look at sites from Arcadia then it should be possible to produce a bibliography of just those writers who are cited in locations from Arcadia. In other words, to produce a customized bibliography of Arcadia in the Mycenaean period. And that goes for any other combination of choices. A customized bibliography for ‘tholos’ and ‘LH’; or a customized bibliography for ‘Forts’, etc. This is now possible with new dynamic bibliography report. In addition to the other reports that are generated from the report page such as ‘Chrono’ or ‘Elevation’ it is now possible to generate a bibliographic report limited to just those categories the user actually chose from the controls page. If the user chose ‘Boeotia’ and ‘EHII’ from the control page then pressing ‘Biblio Report’ on the main report page will produce a new page that contains a bibliography of just those authors and sources in the DB who are cited in support of every EHII Boeotian site. The primary feature of this new page is the bibliography table. 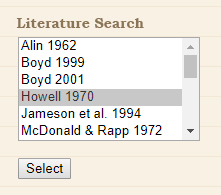 This table has four columns, 'Author', 'Citation', 'Comment', and 'ISBN'. Author: This column displays the author name, if known. 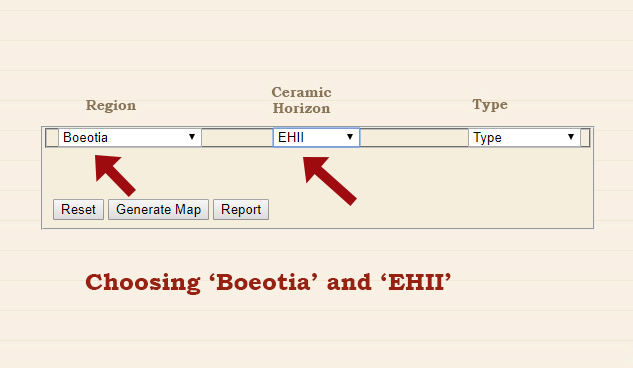 If there is a link associated with the author's name then clicking that link will bring up a map with just the sites in 'Boeotia' in the 'EHII' that use that author as a supporting citation. Citation: This column displays the title and publisher (or journal information) of the work being cited. If there is a link in this column then clicking that link will bring the user to the actual text of the work (.pdf or other doc) being cited. Comment: The comment field displays extra information about the work being cited. ISBN: This displays the ISBN number (or ASIN or DOI) of the work being cited. This is included, when known, to prevent ambiguity. The ISBN is still the best way to identify the exact edition of the book being cited. Here there are ISBN numbers for Simpson and Hagel's Mycenaean Fortifications ... and Privitera's Principi, Pelasgi, e Pescatori because those books are not available online. On the other hand Jeremy Rutter's "Evidence for a Mycenaean Tomb of the Late Helladic IIA period in the Athenian Agora" is online and the page provides a working link to it. Clicking on that link brings up Dr. Rutter's article. Here's the new single citation source page. Since you clicked on Dr. Rutter's name it brings up the single site in Attica which is in the DB and for which Dr. Rutter is one of the sources. In this particular case it turns out to be a grave in the Athenian agora (C1835). 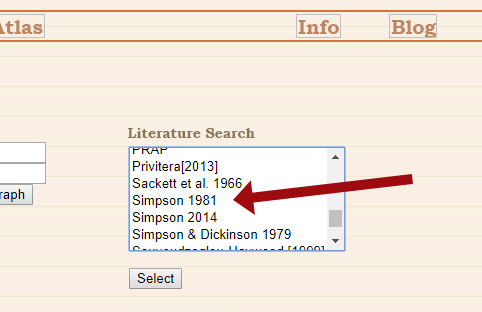 In this way you can quickly track those sites for which specific authors are cited as supports. At the top of this page the original choice criteria are repeated. 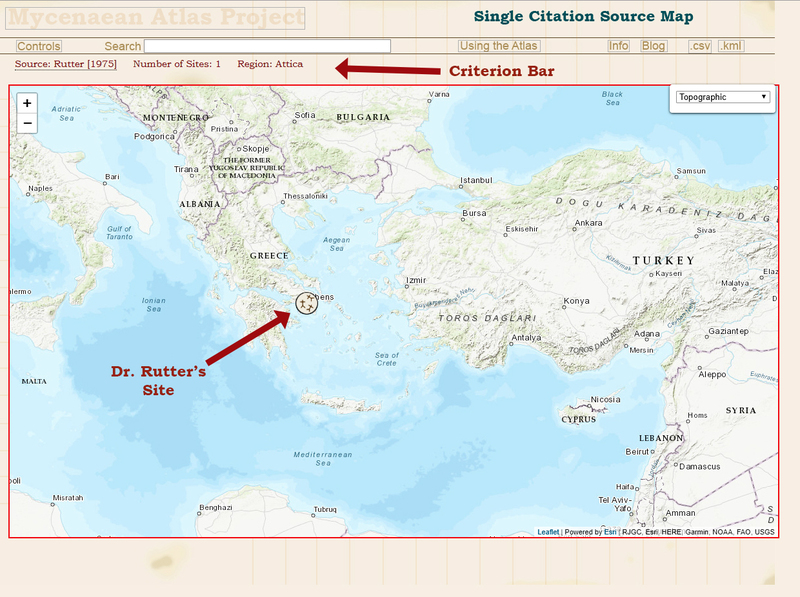 The Criterion Bar says "Source: Rutter  Number of sites: 1 Region: Attica"
Here you can see the black background popup box with the full name of Dr. Rutter's article and its place of publication, namely in Hesperia. To retrieve a report about a site you search for it by entering the place key ID in whatever search box is handy. The place key is unique to each site; it consists of the letter 'C' followed by a three or four-place number. Here's an example. You can try entering something like 'C219' (without the quotes). That place key would have taken you to a search results page with a link on it for the place key 'C219'. the report page for 'Ano Engliano' (Nestor's Palace). On that report page there were several sections describing the site. There is a general information section which gives you the exact latitude and longitude in decimal and DMS form. You are also given the location in Universal Transverse Mercator, and in What3Words form. 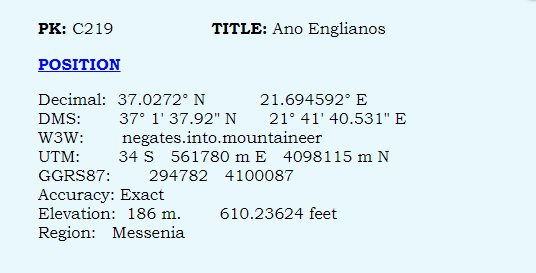 You can see from this image clip that you also get the region (Messenia), the elevation of the site (186 m.) and an indicator of how accurate the given location actually is (Accuracy). There are occasions where that is not possible and when that happens the database supplies an error radius. This is radius of a circle, centered at the lat/lon pair, which touches some part of the sought-for feature. For a complete description of this parameter and of the concepts of Precision and Accuracy as they apply to this web site see this. In this case we are certain that the supplied lat/lon pair actually is the location of Nestor's Palace. The word 'POSITION' on this report is a link to Google Maps. When you click on it Google Maps will open centered on the lat/lon pair in question: Here Nestor's Palace. This is convenient because Google Maps provides a Street View facility which is often helpful when researching sites. The Type section provides some information about the site type. It may be a tholos, a habitation, or something else. Here is an example from site C445 which is the tholos tomb at Koutsochira: Diasela in Triphylia. In this example there are three citations for the type. One is from McDonald and Simpson's famous 1961 article about the Peloponnese (described at the bottom of the place key report). McDonald and Simpson typed it as a tholos tomb. In the second citation McDonald and Rapp, in their report on the Minnesota Messenia Expedition emphasized the general nature of the site as a cemetery. In the last citation Simpson, in his 1981 Mycenaean Greece, typed it as a tholos. The next section provides chronological information about the site. For nearly all sites this is the most difficult information to provide. Ceramic horizons can often be identified (or plausibly guessed at); it is the conversion of these ceramic horizon names into actual year ranges which is controversial. Ordinarily a number of chronological citations are supplied here (with many more to come in the future). It should serve to at least orient you in this area. You should be aware that the year ranges given are expressed in the 'High' Chronology. 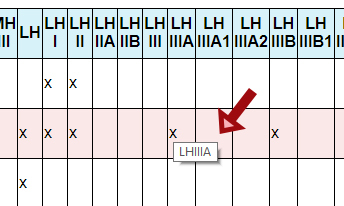 The date of the transition from LMIA to LMIB (LHI to LHIIA) is controversial. Both sides agree that the transition occurred shortly after the eruption of the volcano on the Cycladic island of Thera and the traditional date attached to the eruption (based largely on pottery sequences) is ca. 1500 BC. But more and more scientific evidence is accumulating that indicates the eruption occurred about 100 years earlier; perhaps about 1628 B.C. That means that the (LMIA to LMIB) LHI to LHII transition is to be dated about 100 years earlier than used to be thought. The 'scientific' arguments for retaining the traditional transition date are looking more and more strained and so this site adopts the earlier (the 'High') chronology. The most reasoned and reasonable discussion of the issues can be found in Sturt Manning's essay entitled "Eruption of Thera/Santorini" which comprises Chapter 34 (pp. 457-474) of the Oxford Handbook of the Bronze Age Aegean (Eric Cline, ed), OUP, 2010. 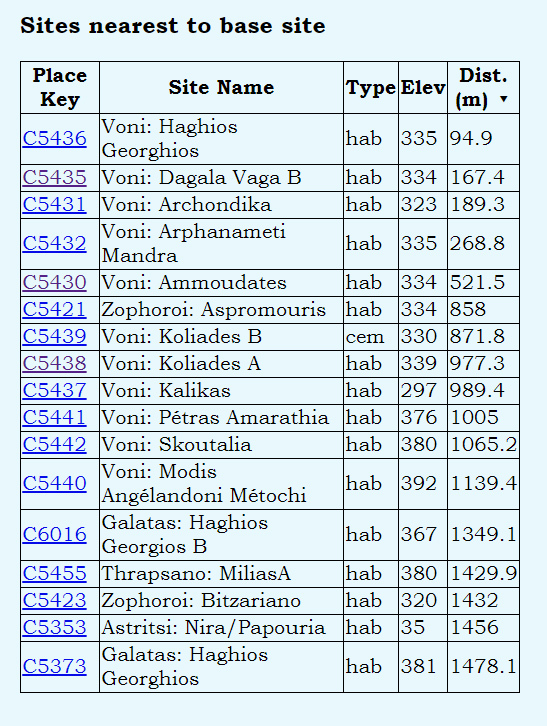 The Mycenaean Archaeological Project database itself does supply Low Chronology equivalents for the Ceramic Horizon names but this feature has not yet been incorporated into the website. The following is an example of the Period (Ceramic Horizon) information for site 'C125' which is a site at Mandra in Messenia. In this example five ceramic horizon citations are supplied from two different works, McDonald and Rapp  as well as a famous article by McDonald and Simpson from 1969 (sometimes called 'Messenia III'). The ceramic horizon name is presented followed by the short form citation of the authority being used. Oridnarily each citation is accompanied by a comment that justifies my citing them in this way. 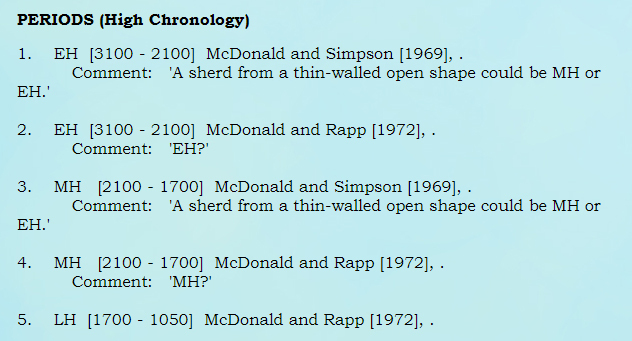 So in citation 1 I have quoted McDonald and Simpson: "A sherd from a thin-walled open shape could be MH or EH", to support the ceramic horizon name of 'EH'. The long form of the bibliographic citation is given in the next section. and, lastly, the page which is 141. 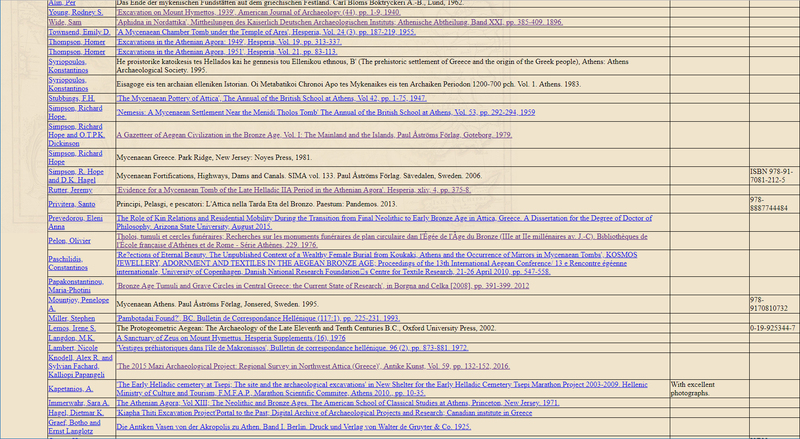 The bibliography section is not meant to be exhaustive. Its purpose is to give you at least one reliable source from which to start your investigation into the site. A fine general bibliographical work in this area is Bryan Feuer's Mycenaean Civilization, Revised Edition, McFarland & Company, Inc., North Carolina, USA. 2004. 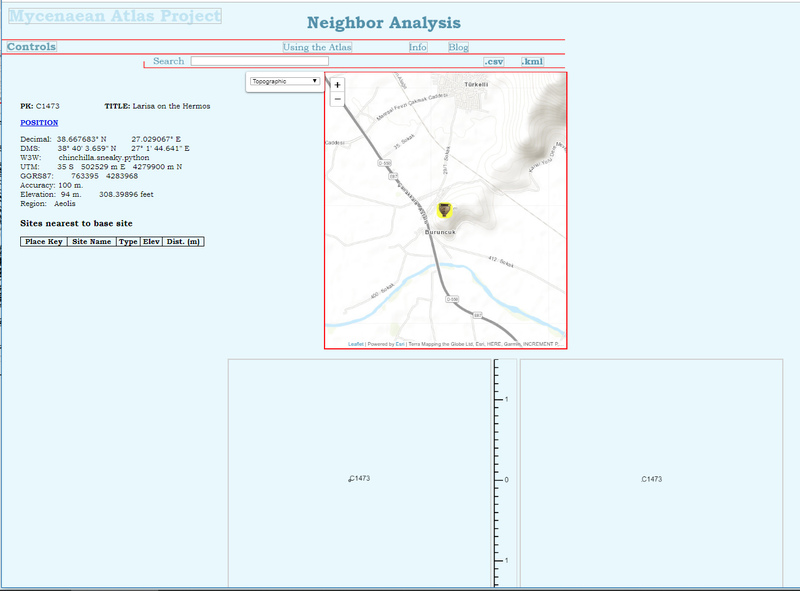 The website helladic.info also supports nearest neighbor analysis for every site in the database. This is part of an effort to integrate all sites to their surrounding environments. A dedicated neighbor page can be accessed from any Place Key Report page. There is a new button, ‘Neighbor’, on the lower menu line of that page. When that button is pressed a new neighbor page will appear based on your anchor site. 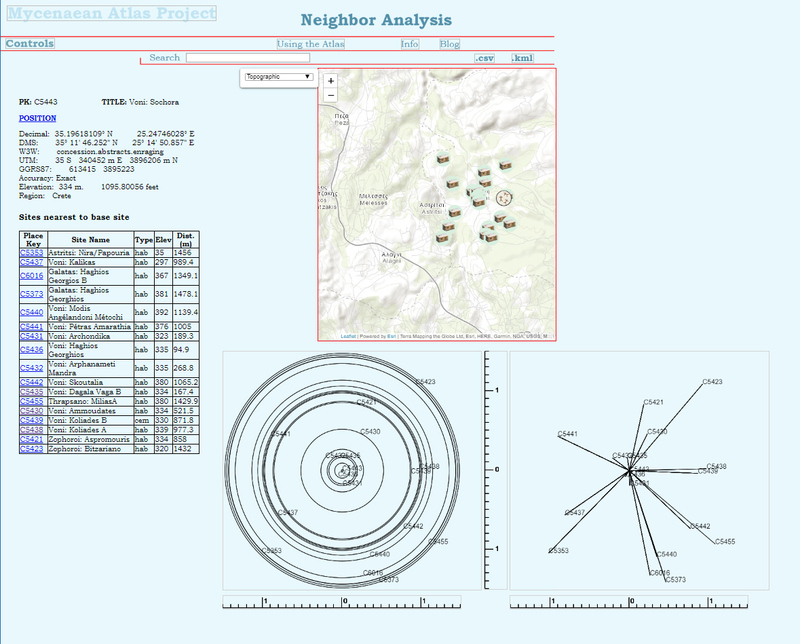 This page contains new graphs and a table based on analyzing the anchor site’s neighbors. To perform this analysis the software searches the database for sites within 1500 m., in any direction, of the anchor site. The area covered is 3 km. square or 9 square km. 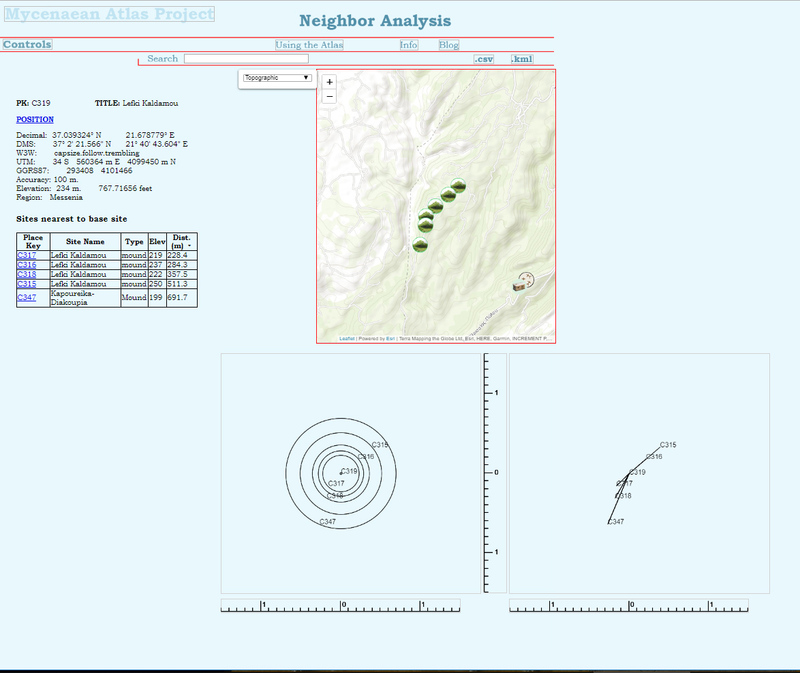 These neighbors are then displayed in the form of a sortable table that lists the place key, name, type, elevation, and distance of the neighbor from the anchor site. 2. Neighbor Chart. Here for neighbors of C5443, Voni: Sochora, which is a town in the Pedhiadha of Crete. The neighbors are also displayed on a new map at the upper right. This map shows only the neighbors and does not display features. 3. Neighbors map for C5443, Voni Sochora. In addition the neighbors are displayed on two new charts. The first is a bull’s eye chart which depicts the anchor site in the center and the neighbors in the form of concentric circles around it proportionate to their distance from the anchor site. The bull’s eye chart highlights gaps or unusual distances between the anchor site and its neighbors. Also it easily shows neighbor sites that are similar distances from the anchor site (no matter in which direction) because these similar-distance sites cluster on the bull’s eye chart. 4. Bull's Eye chart for neighbors of Voni Sochors, C5443 (at center). The second chart is a vector graph that depicts each neighbor as a vector with distance and length proportional to its distance from the anchor site. This chart is an abstract representation of the neighbor map on this page. 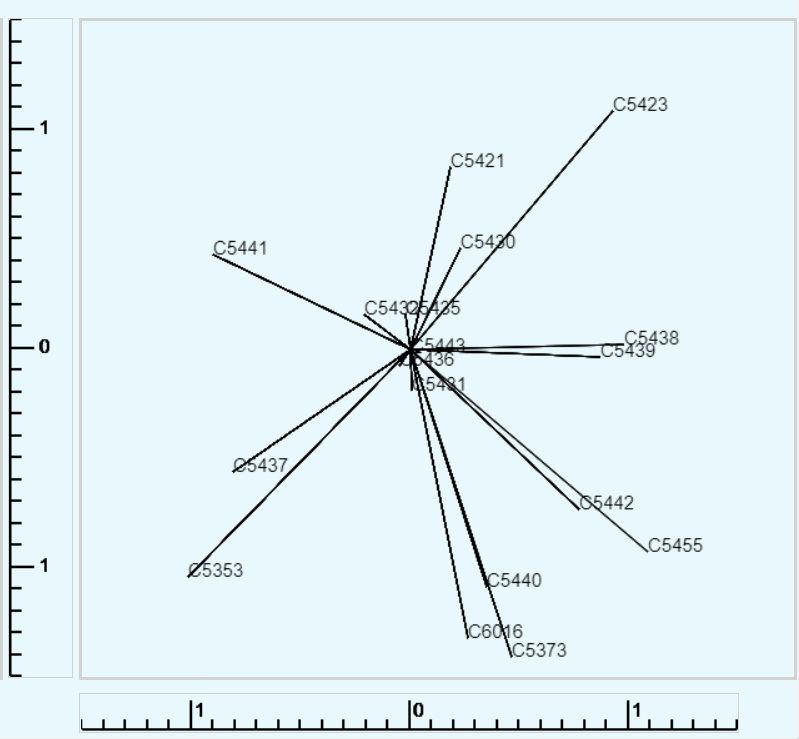 The vector chart, however, depicts distance and direction in a highly abstract way that can be taken in at a glance. Each vector is labelled with the place key of the neighbor in question. It will quickly show, for example, whether the anchor site is surrounded by neighbors or whether it is on one of the edges of a cluster of neighbors. Scales have been drawn to make analysis easier. These scales are useful in measuring distances from the anchor site to its neighbors. The scales display tic marks at 100 m (1/10 km.) intervals. The center value (aligned to the anchor site) is marked ‘0’. Positive distances are marked at 1 km with the integer ‘1’ at ten tic marks to the left and also to the right. For both of these charts and for the map north is to the top. The user should bear some cautions in mind. Neighbors are, of course, limited to whatever is in the database and this site cannot guarantee that the list of neighbors is exhaustive. Also each site has an associated accuracy parameter. If the accuracy parameter for neighbors is not exact then the real distances could be significantly different. 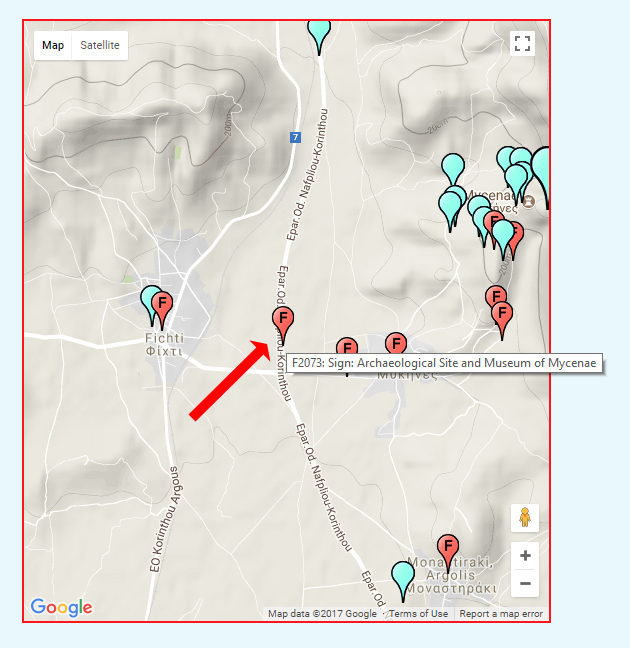 The user should also be aware that at present the neighbors shown on the map and the graphs are from all time periods and may not have existed at the same time as the anchor site. I'm working on making this more sophisticated. The graphs quickly and precisely show that these mounds are more or less evenly spaced and arranged in a nearly straight line. 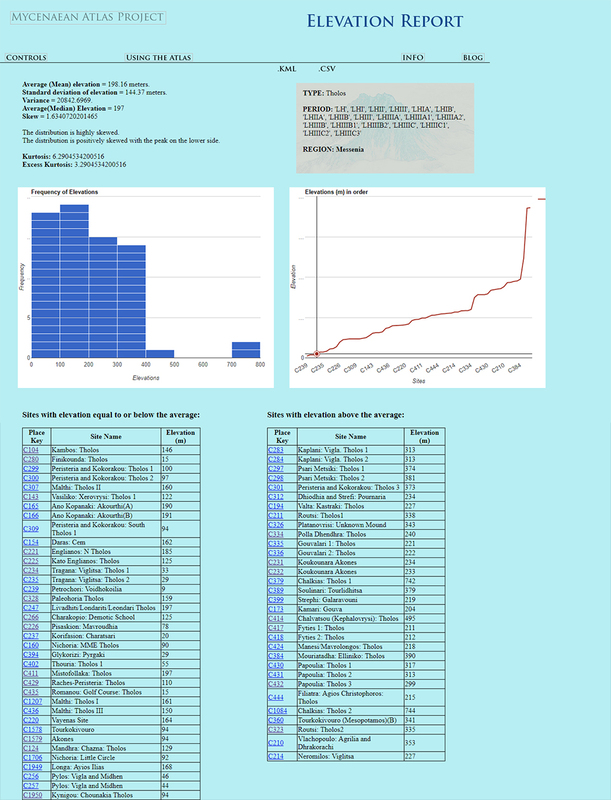 These charts are implemented using the HTML 5.0 canvas. The canvas construct does not support links. You can, however, link directly to any of these neighbor sites from the table on this page. The feature is a currently existing site or object. Features have nothing to do with the Bronze Age or with Mycenaean culture or civilization. A feature may be a town, a church, a ridge or hill, a sign, bridge, or other currently existing object or site which might be helpful in locating Bronze Age sites. Often it's the case that finding a currently existing feature is the best way to locate the BA site you're looking for. So now it is possible to see features on site maps. Each feature has its own ID which is the letter 'F' followed by a three or four digit number. If you click on that icon then an info-box will pop up that will give you more information about that feature. Here we see that an infobox has popped up which gives the ID, the name, the lat/lon pair, the type, and its region. Also there is a link on the infobox. If you click on that link you'll be taken to a page created just for that feature. On this new page the feature you clicked on, F2073, is now centered on the map and made larger than the other feature icons. The blue icons are actual BA sites. They can be similarly moused over or clicked on. When clicking on the link for a BA feature (blue icons) you will be taken to a place key information page. Here you see that there's a link to your desired feature, F2072, which turns out to be a sign to the Treasury of Atreus at Mycenae. Following this there is a working search box. Try it out!